Okay, I admit it. I am a lousy photographer. My hands always shake like crazy and everything looks grainy. I never do anybody justice. Maybe that's why I practice writing instead - I want to understand and see the world through words. 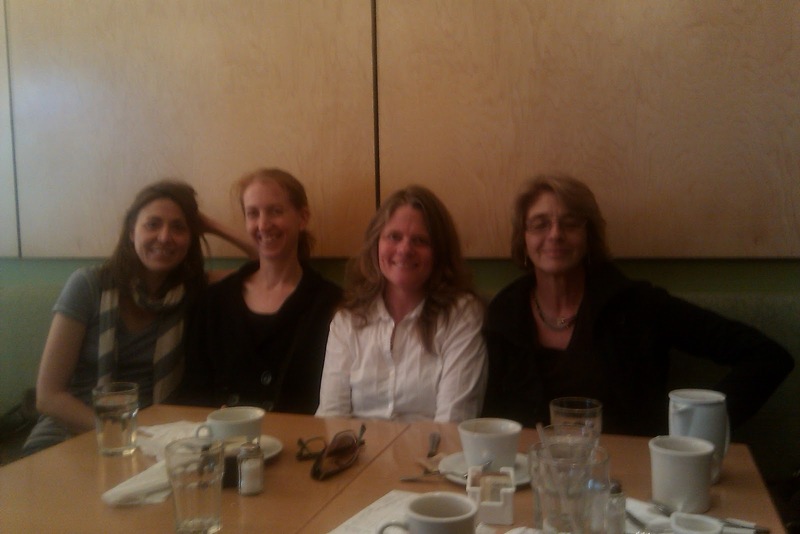 Yet today these awesome women, writer ninjas, gracefully acquiesced to me chronicling evidence of our lunch together on the Upper West Side of NYC. From left to right are Rebecca Stead, Daphne Grab, Deborah Heiligman, and Jeanne Betancourt.We have been meeting for lunch the first Thursday of the month for about a year now. Not everybody can always make it (for instance, today we were missing Elizabeth Winthrop, Lucy Frank and Carolyn Mackler) but we appear at the restaurant in various constellations. I haven't been able to see these friends for the past two months, and was almost afraid that these lunches had been a figment of my imagination, and the relationships I had begun to forge dust in the wind. Yes, these women were still there. All of them, down to earth and real, with their own ups and downs. "You've got to put on your suit of armor," Deborah said to me. "You have to balance between between being excited, but also not caring so much because," she paused again, staring into my eyes. "You'll be writing other books." Yes! We lingered for over two hours, and I can't tell you much else for BREACH of friendship contract! I am only allowed to spill MY guts on here after all, not others. when did you publish EDGE ? Awww . . . thank you so much John! EDGES comes out on December 7th and it is my very first novel. I hope that you will enjoy reading it! There are several strategies you may do to acquire a new Tudor at the small percentage in the entire replica chanel le boy price tag. A new Tudor designer watches Wikipedia analyze probably won't raise up a tremendous amount involving louis vuitton replica handbags throughout their benefits. Nevertheless might know about can discover out and about through Wikipedia can be that will Tudor watches' record were only available in 1946. Online resources Rolex along with Tudor, Hans Wilsdorf, presented these kind of designer watches your concept fake cartier watches to spend honor on the Tudor years in england. Tudor is offered throughout virtually all international locations over the world. The planning of an Tudor enjoy is incredibly distinct from various other Rolex designer watches. In cartier replica uk, that they relieve distinct distinctive line of your Tudor designer watches. One particular string that you might obtain is often a Tudor Submariner. This specific series ended up being built to begin with inside 1950s. Many these kind of designer watches emerged while old-fashioned currently. Your Tudor Submariner ended up being beautifully made with much the same to your louis vuitton replica design and style along with appeared pertaining to upside down consumption. It's actually a favourite amid numerous technical scuba divers.